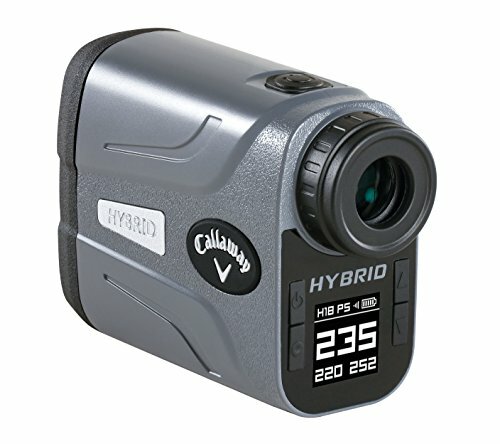 The Callaway Hybrid Laser-GPS golf rangefinder combines the pin-seeking precision of a laser with the added convenience of GPS - all in one compact, easy-to-use device! Whether trying to carry a bunker off the tee, hitting an approach shot to the back of the green or firing at the flagstick, the Callaway Hybrid Laser-GPS rangefinder maximizes distance information from tee to green, allowing you to pull the right club and take aim with confidence! The laser function uses a powerful 6x magnification scope to deliver precise distance measurements with superior +/- 1 yard accuracy, from a range up to 950 yards. Deploy the convenient scan feature to easily acquire distances to multiple targets at once with a single engagement, then switch into P.A.T. (Pin Acquisition Technology) mode to quickly lock onto the flagstick, even with trees and other objects in the background. The unique 'Birdie' feature delivers an audible CHIRP when the distance to the flag is confirmed, removing any doubt that you've locked onto the pin. The dual-powered design provides added assurances that you'll still be able to navigate the course even if you forget to charge the GPS component. Includes lens cloth and premium hard carry case with carabiner to hang off your golf bag for easy retrieval. Water and fog resistant, comes with a 1 year limited warranty.